It seems we are encouraged at a young age to share. I am constantly telling my 2.5 year old to “be a good sharer” and “share with other people so they will share with you”. But, let’s face it. Sharing is just not natural. It’s learned and not everyone get’s on the sharing-means-caring bus. I’m a good sharer. I love to share food – put a bunch of different plates in front of me and I’m in heaven. I always share my last piece of gum and I will let you borrow my clothes as long as you promise to bring them back in the same shape you borrowed them in (yes, I know). But it wasn’t always like this. Back in the day, I was a horrible sharer. So bad that I wrote the word “PIE” on all of my things – Baby Alive, Malibu Barbi, Easy Bake Oven, Raggedy Anne – PIE, baby. Why PIE? Who the hell knows. Pie is yummie, I guess. So, if it said PIE, it was mine. My sister remembers this phase fondly and didn’t give a crap about PIE and tried to use my stuff anyway. It wasn’t a pleasant stage. Well, luckily the PIE-phase passed (though my mom still has the dolls with PIE written across their foreheads) and I am the sharer I am. How did that happen? What changed? I am sure there are a bunch of you behavioral psych folks out there who can tell me why it changed, so come on and let us in on the secret. For the rest of us, let’s fast forward to the here and now. So, along comes Web 2.0. The “social” era. What’s it all about….you betchya, sharing. Photos, profiles, music, friends, walls, lifestreams, hobbies, resumes, tweets, videos the list goes on. What makes some share and others adamant PIE-er? Here’s my $.02. 1. Privacy. This is probably the biggest reason. A guy in my office (who will remain un-named) will not disclose a photo of himself to anyone but his immediate family. I completely cannot relate but it’s his right to keep it to himself. I often wonder – is it the worry of what could happen if said photo hits the net and is used to begin stalking him? Or is it something simpler – perhaps a discomfort with putting yourself out there. I’ve even heard of the suppressed “Catholic Guilt” theory. In any case, people have their own reasons and for that they get the PIE stamp. 2. Time. Many of the non-sharers I talk to say it’s a waste of time. Who has time to share photos or tell people what they had for lunch? Well, then, how do you explain the droves of people on Facebook and Twitter? They have time. Some of them, yes, too much time on their hands. Others, like me, juggle a million different things and social media is just a natural part of the day. Like checking my email or sending a text message or getting my latte. It is how I live. 3. Aversion to change. Can’t teach an old dog new tricks. This is true with the people out there who just can’t change. These are also the people who say they have nothing to say. Everyone has something to say. Come on, people! These are also the people who don’t see the value in sharing, they don’t care and they’ll argue till the death against it. To them I say, bleh. 4. Generation. Age definitely plays a factor. How many of our parents are on Facebook? or iLike? or Twitter? or FriendFeed? My guess is a very small percentage. My 60 year old uncle sees Facebook as a privacy disaster waiting to happen and a good way to start a high-school girl fight (he’s a high school teacher). My dad is still trying to figure out how to upload his photos to Snapfish and send me an email to tell me I can view them. Then I see some of my friends’ dad on Facebook and wonder, would I want my dad seeing me out on the town partying it up? Hm, not so much. 5. Lifestyle. There are people out there who just aren’t in the know. Yes, I know, dear reader, it’s hard to imagine. I have a friend from high school who just got email. Yes, I said email. It’s beyond me but some people just don’t have the lifestyle desire to get on the technology or the sharing bandwagon. So, what does all this lead to. Well, if sharing is caring, what does what you share say about you? Are you a frequent Facebook status up-dater or are you more of a lurker who is present but not participating? 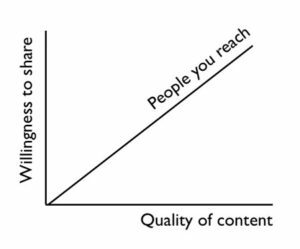 If you’re a sharer, what’s the quality of what you share? People are fickle. They want to be engaged and entertained. When your posting, writing, uploading – think about the quality of your content and what it says about you. If you’re a sharer, take the quality of what you’re sharing to the next level. If you’re still in PIE-mode, come on now. Maybe you can take a baby step. Try out a social media site and see what it’s like to connect with a few new people or find out something new about someone you already know. Sharing makes you a contributor. The old way of learning was very one-dimensional. Now, I learn every day thanks to social media and people who share. New websites, products, ideas, personal updates – I have the ability to take it all in and decide how to use it. That makes me smarter and that makes me happy. Be smart. Be happy. Be social. Previous PostIs Oprah jumping Twitter's shark? Shel, I totally remember when you would write “pie” on the dolls foreheads. Mom hated when you did that! Mom said you wrote “pie” cause it was the only word you could spell. Ha Ha. Dad laughed at the snapfish comment. Although, Greggie mentioned that if you were to ask his Dad about snapfish – he would probably think it was a type of exotic fish or some sort of fishing gear….. Ya goota love our parents. The issues with social media, though are beyond sharing. In todays world anyone can become fixated with your looks, words, ideas, background…and haunt you forever. For young inpressionable teens, parents need to spend some time on these social web sites, learning what’s goin on in their kids life and offering advice on how to assure thier safety. Yes, this is great technology and here to stay. But like almost every new technology some idiot discovers a way to unlock its hideous side.